The nineteenth-century Yorkville families may well have used wooden butter stamps featuring images such as these. Hilda and I never played baseball with uniforms, referees, coaches, or practices. Baseball, to us, was the game you played on the diamond by the well pit or out in the sheep pasture, whenever a family picnic brought in enough players. Players ranged in age from the six-year-old just learning to swing a bat, to Dad, who was permanent pitcher. With Dad pitching, the young child’s hit managed to roll right past the pitcher’s mound, yet Dad always seemed to catch the ball hit by the teenager. Our games were more about everyone playing together than keeping score. When writing Hattie’s War, we drew on our childhood experiences to create the neighborhood ball games in Hattie’s yard. This Saturday, we’ll be watching the Milwaukee Cream Citys play vintage baseball. Their games, played in an open field in a park ringed by oak trees, are much more like our games in the pasture than like watching the Brewers at Miller Park. 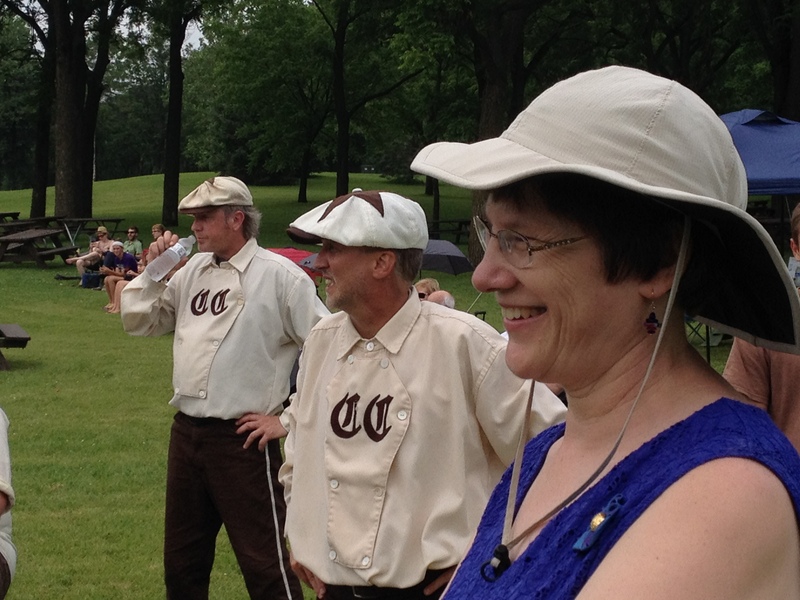 Please join us at Greenfield Park at 1:00 on Saturday, May 2 to see how base ball was played in Hattie’s day. Bring a lawn chair or blanket and enjoy an afternoon outdoors. Details can be found on the Cream Citys webpage. Books will be available for purchase as well. Last April, a flooded basement put one third of our living space out of commission. Like many others in the Chicago area, we were faced with the ordeal of salvaging, cleaning up and rebuilding–again. As my husband took off for a five-week trip to Asia, I was left to try to reconstruct our sons’ bedroom. On more than one occasion, I was brought to tears wishing that my father was still alive. Dad would have known how to do this. Dad would have come down to help me. Dad could have fixed this. I recruited friends from church to help me put up drywall. Perhaps I should rephrase that–Greg and John put up drywall, and my son and I helped. Once it was in place, I spent Mother’s Day taping and mudding. Unfortunately, I had never done this before, and the book on drywalling that I had checked out of the library wasn’t as helpful as I had hoped it would be. Still, I kept at it, and halfway through the room I realized that I begun imitating what I had seen Dad do when patching holes in our plaster walls at home. By using the same kind of pressure on the drywall knives that Dad had, I was getting smoother walls. Too bad I was working in the closet by this time. Lessons from our fathers stay with us long after they have left us. What a blessing when we discover a lesson that we didn’t even know had been taught. In Plank Road Winter, Hans’s father dies in the Chicago Fire. But as writers, and as daughters whose father died six years ago, we know that Hans will continue to learn lessons from his father. Thanks, Dad, for all you continue to teach me. The lilacs in my yard, some of which have been brought to Illinois from the McEachron homestead, have bloomed and faded. The cold, wet spring has turned overnight into a blazing hot Memorial Day. Though I have another week of school, I am looking forward to summer days when I can dedicate more of my time to writing. (Good Lord willing and the creek don’t rise.) 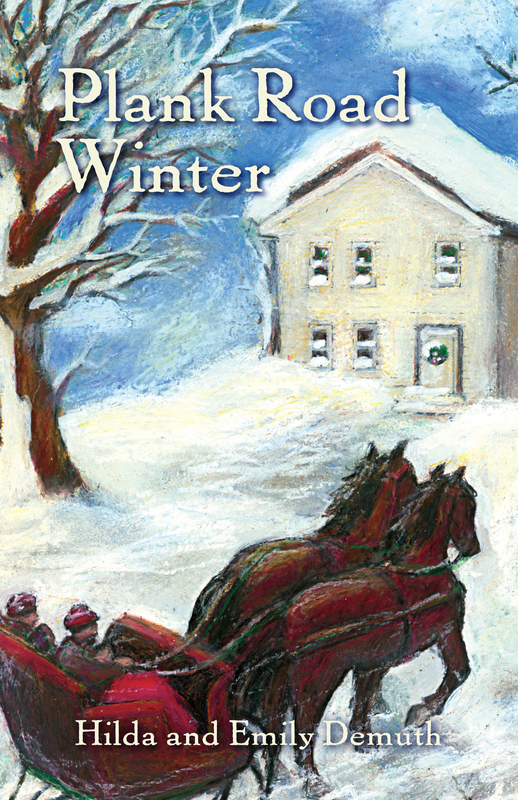 Another revision of Plank Road Winter is underway, and other stories linger in my mind, waiting to make their way onto a printed page. I also have a quilt to make, though not as intricate as those in Plank Road Summer. I’ll be cutting up old t-shirts to make a quilt for my son to take to college. Pieces of his grade school, middle school, and high school years will travel with him on his new adventure. A piece of my grade school days just came back to me. Mr. Schmidt, my first principal, just commented on our “About the Authors” page. Please click to the Comments on that page to find a brief memory of my early years at Yorkville School. As another summer arrives, I hope you all find time to enjoy whatever changes the season brings to your life. What better way to finish writing Plank Road Winter, set in Chicago and Wisconsin in 1871-72, than by candlelight, with the power knocked out by the second largest blizzard in Chicago history? Though some people might have complained about the storm, for Hilda and me, it was a perfect gift. In our own homes, we settled down to hot chocolate or coffee and, sheltered from the howling winds and blowing snow, hammered out the last couple of chapter revisions. Winter, with its shortened days and cold weather, can be a season of darkness and despair. My few hours of candlelight, while the blizzard raged outside, were enough to make me thankful for central heating and electricity. 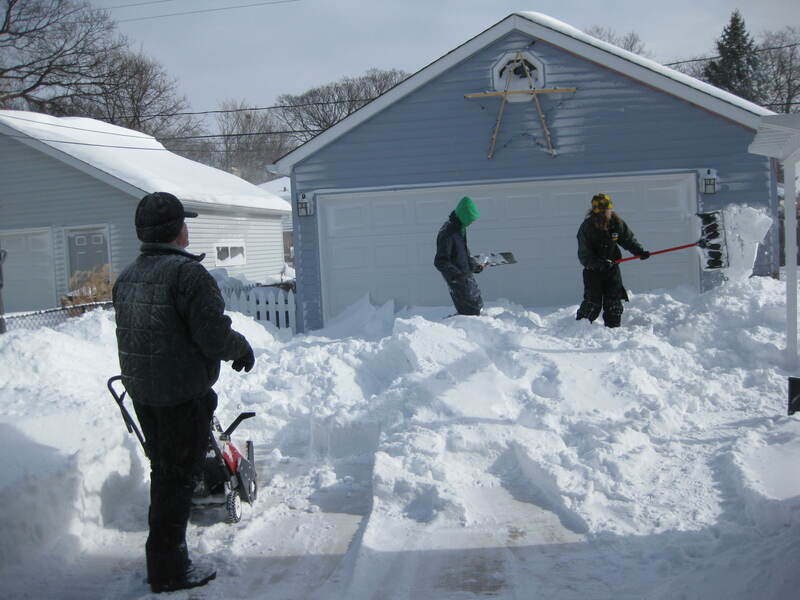 The next morning, when the sun was bright, I sent my teenagers out to shovel. When a neighbor came by with a snowblower, I felt obliged to leave my manuscript and lend a hand. Once outside, my children and I found that the snow that had cut us off from the wider world also reconnected us to the neighborhood, as we ventured through the drifts to see how others were faring. We helped dig out an SUV that tried, unsuccessfully, to make it down an unplowed road. We invited a neighbor boy to jump off our porch railing into the snow below. There was time for simple pleasures we don’t make time for in the rush of our everyday lives. Plank Road Winter captures despair and dark days, but the story also celebrates the neighborliness that gets us through our difficult times. We look forward to sharing the story with our readers. In the meantime, we hope that you have come through the Blizzard of 2011, and we would like to hear snow stories from your neighborhood. Last year, with our book fresh off the press, Hilda and I enjoyed our own Plank Road Summer. We traveled about from one book event to another, eager to share our story with others. We felt like real authors, which seems a bit more glamorous than our everyday lives. This summer, for me, has been exceptionally less glamorous. I had very good intentions, when the school year ended, about getting back to writing (We’re working on the sequel!). But on June 23rd, when I was home alone–no husband, no children–it started to rain. And hail. And pour. Yard flooded. Basement leaked. Tornado sirens wailed. Power failed. Sump pump quit. Basement flooded. Went outside to get a neighbor to help start the generator. Fell and broke my right (writing) arm! Neighbor arrived. Got generator going. BUT couldn’t get to hospital because the streets were flooded. My house was an island with water lapping against it on all sides. Called 911. A firefighter came to my rescue. Waded a long block through knee deep water to the ambulance. When I sat down on the gurney and lifted up my feet, my wellies flooded the inside of the ambulance…. Some of you can imagine the rest of my summer–a hot, itchy cast well past my elbow, sorting through sodden masses of possessions, drying out and reconstructing. And family visiting from Japan and Baltimore in the midst of it. A month later came a second flood, and another family member took an ambulance ride through the flooded streets. Life is what happens when you’re not writing. It’s the challenges, heartaches, celebrations that form who we are and make up our own story. It’s Plain Old Summer, which isn’t really plain at all. It’s memories, adventures, emotions, family, neighbors. It’s the kind of thing you could write a book about. Maybe I will. I was asked to speak about Plank Road Summer at a couple adult and youth Sunday school classes. Since an author never turns down an invitation to talk about her book, and the church was close to my heart, I agreed. Though we didn’t write our book as a moral tale, we don’t need to search very hard to see faith issues at work. The 1850s Wisconsin community was facing a moral dilemma–what side would they take on the slavery issue? When Hilda and I started writing our book, every character in the neighborhood was against slavery. How could anyone have an opinion other than that? But as we dug deeper into the issues and laws of the time, we realized that some people in that community would have believed that following the law of the land was the right thing to do. The law stated that slaves were to be returned their masters in the South. This became a starting point for my Sunday morning conversations–what would you have done? Would you have helped the slaves? Would you follow the law? Would you risk a $1000 fine? We came to understand that the people of the time would have faced an moral dilemma–when the right choice may not have seemed as obvious as it does to us today, 150 years later. What issues do we have today that are dividing our communities? Health care, illegal immigration, human rights, political divisions. We face moral and ethical dilemmas every day, some close to home, and some at a national or international level. My hope is that as we face the issues that divide us, we can remember one lesson from Plank Road Summer: In the end, everybody joined the dance. It didn’t matter who won the horse race or who was an abolitionist or who was part of the posse–everybody joined the dance. As a country and as local communities, we need to take time to celebrate the unity we share, despite our differing opinions. How would our world be better if we listened more, accused less, worked together, and invited everybody to the dance? The county fair is home to such competitions as cattle shows, tractor pulls, demolition derbies, pie auctions, and goat-milking contests. I admit that my sister author Hilda rose victorious when we battled one another last weekend in the goat-milking competition at the Racine County Fair. Oh, the humiliation we authors must suffer in search of publicity for our books. Other than being soundly defeated in the competition, I had a lovely day at the fair. Our book tent featured an antique drum carder which fairgoers could crank to card wool for bookmark tassels. We also had live music–our own fiddler Matt Lutze, Hilda on penny whistle, and editor Phil Martin on accordion. We saw familiar faces and met new readers as people stopped by to purchase a book or find out more about Plank Road Summer. Even the Fair Royalty visited our booth to add planks to the road we were building. During every summer of our childhood Hilda and I spent five days at the Racine County Fair. During the weeks prior to the fair we practiced showing our sheep, refinished furniture, sewed clothes, or worked on whatever other 4-H projects were to be entered into competition. In our day, we could hardly take five steps at the fair without seeing someone we knew. The fair was a community celebration, and everyone wanted to be part of it. In Plank Road Summer this is the spirit we hope to communicate in our depiction of the first Racine County Fair. I confess that after my defeat in the goat-milking contest, I am feeling a bit like the loser of the horse race. But strike up the music– in a true community celebration, no matter who wins or loses, everyone can join in the dance.